Will be looking for a pair of 8' terminated with nanners. Now that I've sold my pool table I'll be relocating the 2 channel rig to a new rack(yet to be purchased). I figure 8' will do it but I can always tale care of an additional foot or so. Not sure if it matters but the speakers are SDA2B, amp is a Parasound HCA1500 and the pre is tubed Dynaco PAS4. Anybody have something in the closet to save me a few bucks on new wire? No rush on this since I have yet to decide on the audio stand. I believe @DSkip has a few still or sale that would suit you. As much as I would love to have any of those, the Mrs would shoot me. The Helicon 16 from wireworld is a good budget option. I prefer the OCC but it’s a big hike for the improved conductor. I have some MIT Avt1 for sale. Pro tip -- be sure to specify metal not plastic. Use red ones for "+" and black for "-" if available. 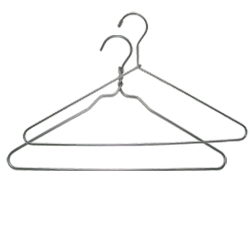 Problem is I don't have 8' of hangers and would have to splice them which I'm sure requires tools I don't have. The "boss" says I have a budget of only around $200 and she's even on the fence about that since I'm also splurging for a rack at the same time. I doubt the MIT's are in this range, but if they are PM me! I can pick up some Audioquest Rocket 33 or Type 8(no frills) for about the same price.....not sure which way to go. Not that this is necessarily helpful but at least it will be a serious reply! So... all three of the above-mentioned cables seem like worthy and (?) cost-effective options? FWIW...I was previously using some of that "Anti-Cable" sort of stuff (i.e., twin runs of 18 gauge varnish insulated magnet wire, it was store-bought but I am not 100% sure of the brand) which sounded pretty good (better than zip cord) but was (is) ungainly due to its stiffness. Best suited to a one and done installation -- which is anathema to me. That image looks like it should also have an "As seen on TV" logo on it! That said -- the cool guys on my rather rarefied side of this hobby (i.e., fleapowered/low powered vacuum tube amplifiers and large, high-sensitivity loudspeakers) seem to be enamored of this Duelund wire... it's not inexpensive, though (at least by my standards) and I've not heard it (at least, not knowingly). Probably a little out of step with the kind of wire that's fashionable around these parts, but still I figured I'd mention it. Well, you have me thinking now Have read some good things about Mogami W3103. Also looked at Canare 4S11 and Belden 5000. I'm thinking with my hearing I probably can't go wrong with any of these but am open to opinions for sure. Also, why would one select nanners over spades or visa versa as long as either are an option for the equipment in use? Canare 4s11 use this link. if you call Have inc they will beat the price. the last time I called it was .95 per foot. Have Inc. is a great place to do business with. I'm going to go back to recommending the Helicon 16 OCC as an option. I am a huge fan of OCC conductor as you can literally hear the graininess of the OFC disappear. OFC is a cluster of many crystals which is interesting as it usually has a grainy sound to it. OCC is essentially a single crystal stretched out and it smooths everything out. This is a big reason why the Equinox speaker cables are my standard recommendation. 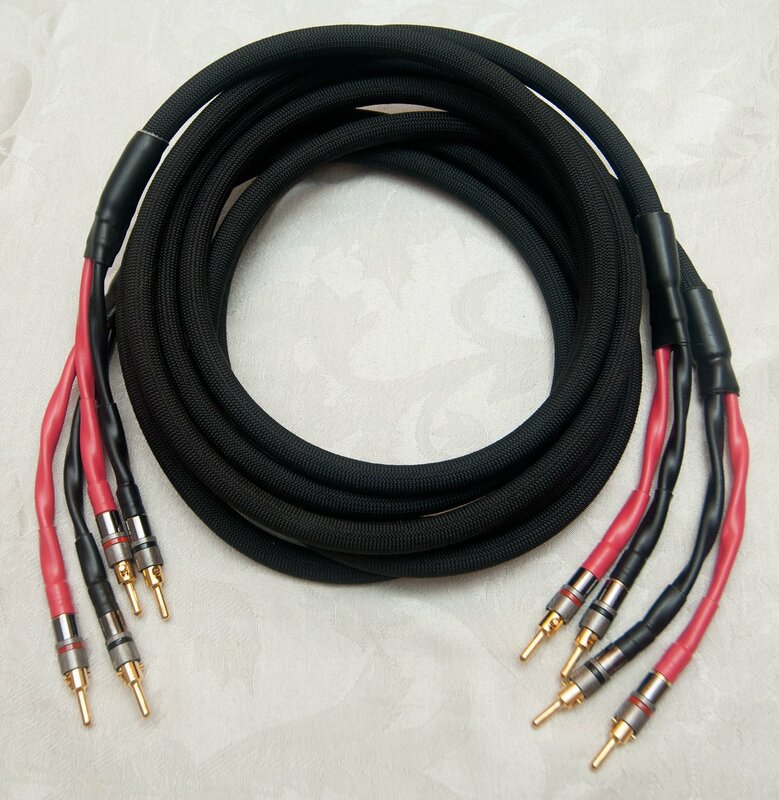 I know you said $200 is your max and I'm not trying to push, but if you could find a way to make the Mini Eclipse I'm selling in the Cables thread work, it would be a long time before you'd ever have to touch your speaker cables again. Mogami 3103 (12g twisted pair) is great wire. Dave - @Daboyz - just handed me a pile of it to terminate. Unfortunately I've misplaced my heat gun (new one on the way) over at my sons house so we're experiencing a delay. But I did have my own 3103 that I've rented him at an exorbitantly high price until I've got these done. Mogami 3082 (14g coax) is also a variation that I've used. It's not quite as impressive physically as the 3101 but is also a very good speaker wire. Mogami 2534 (2 pair of 24g twisted with a shield) can also be used. Just tie all the wires together for about 15g. If you're still shopping let me know. The 3082 could be let go... I don't remember how long they are. I know the ends are different vendors but both ends are 'naners. Check the market for the 3082. Now that I've thought through it I'm not sure where I would use that and it might as well be gone. I really like those Viablue connectors. First time I've seen an insulating jacket over the actual nanner. I'm leaning toward the 3103 with those connectors but still undecided. Once I relocated the rig(wall to wall carpet being installed today) I must take better measurements for the length needed. As usual, I'm probably overthinking this for a short run of speaker wire but all the input is greatly appreciated. I think I have some Canare cables, but the banana on one side for both right and left is bare and I will have to measure it. I will take some pictures tonight. Edit: Mods if my post is not appropriate please bin it. Just trying to help local charities during the Thanksgiving and Holiday season. I have a pair of 8 1/2 ft. Canare 4s11 speaker cables I'll let you have for $125 shipped to you. Let me know if you are interested. I made these cables several years ago and used them in my main system before I started upgrading. Sorry, my cables are shorter than what you need. I bought @daboyz Wireworld speaker cables over in the FS stuff - the blue ones, Oasis? Not sure what generation, not sure how long they were run. Pulled the Groneberg cables, these are the ultra shielded Quattro Reference wire terminated with Via Blue tubes at the wire and T2 spades on the speaker end and T2 banana's on the amp end. I've never doubted them for a minute but it was time to shake things up. They've been in for all of 15 minutes or so and although not night and day difference I'm going with better... Bass seems more - that's all I'm going to give it for now. Nothing standing out yet in mid to treble but definitely no losses there. I don't like moving things around on the main rig so don't expect me to pop the Grony's back in, nor will the Mogami's get pushed in there until I'm ready for another changeup. And based on what I'm hearing that might be awhile. Another option that you won’t find is PNF Audio. Great cables that nobody ever sells anymore. Part of me wishes I would have kept my two pairs. It’s been about a year since I’ve seen any listed anywhere. For what it’s worth, the Equinox is what finally got me out of those. The biggest improvement? A loss of grain I didn’t know the PNF exhibited prior. They've been in for all of 15 minutes or so and although not night and day difference I'm going with better... Bass seems more - that's all I'm going to give it for now. Nothing standing out yet in mid to treble but definitely no losses there. Give them time to settle in physically undisturbed. It can take a while to break them in. In my experience I usually start to hear positive changes around 50 hours of active signal. Ok, firstly I want to thank everybody for the offers/suggestions. If nothing else I learned a thing or two from doing some research. Now it's with a red face that I must admit I started this thread due to a bad memory....I was the recipient of a pair of cables from a Karma by Trey, the Supra Quadrax speaker wire. I tucked these away until the music room got rearranged and now they are getting ready to be put into the rig. 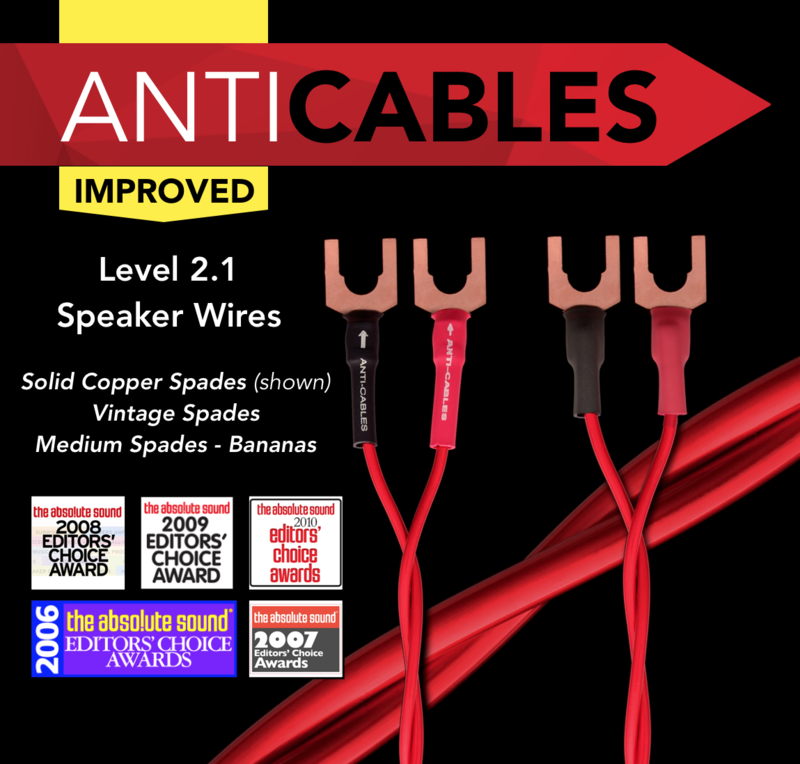 If nothing else I will give a short review of them compared to the much cheaper looking wire I had been using. Since this is the WTB section I thought I would mention I now need some nanners or spades that will take bulky wire. Once each pair of this wire is twisted it is fairly "thick". Get with Doug for those terminations. You still want to sell these? Need an upgrade for my 703s, and this is the perfect length.